A few days ago, Denise B. Scott, published a blog post entitled "Do You Remember Why You Do What You Do?". If you haven't read it, I would encourage you to do so. And while you're there, subscribe to her 'Ideas to Inspire'. I look forward to her posts every few weeks and they certainly help keep me inspired. My “why” – For those of you that know me, you have most likely heard me tell my ‘why’ story. The short answer is because of my grandmother and originally, location. For those who haven’t heard it, here’s the long but meaningful reason I do what I do. Growing up on the farm, we shared a double-house with my grandmother. I saw her every single day. On weekends as a child, Grandma would say to me (and please don’t take offense, but these were her words), “It’s time to go visit the old ladies at the home”. And off we would go to the local nursing home. Until I went away to college, I went with her to the small 60-bed facility. We typically would spend the afternoon, visiting with her friends and family members that resided there. When I was younger, I recall running up and down the hall, most likely causing havoc and irritating the nurses. As I got older, I began visiting with other residents while Grandma would still be in her friends’ rooms. They would share stories that fascinated me (and still do). I would see rooms absolutely packed with all of their belongings. A lifetime of mementos crammed into such a tiny space, each item so valuable to them. They would tell me the history behind the items and why the particular piece meant so much to them. They would tell me tales about the people in their photos, usually family members who had often been influential in their lives. The men would share favorite and not-so-favorite memories of their former jobs and military experience. The ladies would share their favorite meals to cook, humorous stories of their children, and how they would make the grocery budget last all week. I remember thinking that those residents seemed to be just aching for someone to listen. They had an identity and still wanted others to realize who they were. This was the 1970s and early 1980s; that wasn’t a prevailing concept during that time. The medical model was all staff knew. Fast forward to the late 1980s and early 1990s - Grandma got Alzheimer’s disease. For many years, she’d still visit the ‘old ladies’, but would need someone to drive her. When I was home, that was my duty. I tended to not always stay the whole time, but would go in for at least a while. I’d see the same residents each time, sitting in the front lobby by the aquarium, lined up at the nurses’ station, or sitting somewhat lifelessly in the hallway staring out into space. The same rooms with belongings practically spilling into the hallway. Bingo being conducted in the dining room. For some reason, as I became a teenager, what was fun to do as a child now seemed to be rather depressing. As we’d get into the car after each visit, Grandma would always say the same thing to me – “Don’t ever let them put me in here”. My parents cared for Grandma at home for many years - hiring caregivers, rearranging their lives to keep Grandma safe and comfortable. On one occasion, they needed to go out of town and arranged for Grandma to have a respite stay at the nursing home. Upon my parents’ arrival home from their trip on that Sunday afternoon, they discovered my grandmother sitting on her back patio. She was, of course, supposed to still be on her respite stay at the nursing home. No one in the family had any phone calls from the nursing home. No notice stating that Grandma was missing. So we didn’t call them either. Mom simply went into the nursing home and told them she was there to discharge Grandma. The nurse very obviously thought Grandma was still there and went to get her. After the staff began to realize that Grandma was missing, Mom confided that she was already at home. We were able to discover that a family friend had been visiting a loved one at the facility, saw Grandma, assumed she was doing her weekly visits, thought he’d save someone a trip into town to get her, and offered to take her home. Of course, Grandma said yes. When the time finally came that Grandma’s disease had progressed in such a way that my parents simply could no longer care for her safely at home, they emotionally moved her into a small private family home with 3 other older ladies. The owner of the home and her family members cared for Grandma until her death in February 1995. It wasn’t necessarily the prettiest environment; it most likely would never have passed a nursing facility’s ISDH/CMS inspection; and definitely the home would not have gotten through OSHA. But Grandma was comfortable there, my parents honored her wishes, and the owner/family obviously cared about her and kept her safe. Prior to Grandma’s death, in 1994 I graduated from college. With the feelings that most early 20-year-olds have, I was ready to conquer the world, but had no real idea what was ahead. A high school friend was working in medical records at the ‘new’ nursing home in town and said that there was an opening. It was about a mile from my house and within 3 blocks of my child-care provider and nursery school. I took it as a sign. I became the Director of Social Service/Admissions/Marketing in 1994. I was determined to never forget my childhood memories of visiting the “old ladies in the home”. Never to forget that Grandma obviously hated what she witnessed each week so much that she made sure we all knew she didn’t want to live there herself. Never to forget the feeling of seeing residents staring out into space, their cramped rooms, their need to have an identity and tell their stories. Never to believe that the prettiest facility is the best, that caring and compassion are much more important. And never to forget how mentally hard the decision was for my parents to move my grandmother off the farm. Except for the family farm, nursing homes continue to be my favorite place to be. I think of Grandma with every visit. And I believe that taking me with her was the greatest gift I ever received. Making visiting our elders a normal act is a priceless gift we should all give our children. After 19 years in the industry, we have come a long way from what I witnessed in the 1970s. I look forward to the day when the regulators realize that enabling/encouraging staff to take time to listen to stories and being able to know the residents’ identities is much more important to their quality of life than some of the regulations and would ultimately improve quality of care. Most families would rather have someone listen to them for 5 minutes than spend that time posting the required staffing sheet that virtually no one reads. I still feel that we can continue to improve care for our elders – one day, one person, one change at a time. What is your “why”? I look forward to hearing why you do what you do! Does your Social Service department need general assistance, help 'keeping up' with MDS 3.0 assessments, or require monthly consultations to meet the requirements of F251? Contact us at Simmons Healthcare Consulting, LLC, and we'll be glad to help your nursing facility maintain or achieve regulatory compliance. An updated version of the 'Advance Directives - Your Right to Decide' brochure has been released by the Indiana State Department of Health (ISDH). Included in the revision is information related to the new Physician Orders for Scope of Treatment (POST) form which Indiana has approved beginning July 1, 2013. The brochure also now includes Out of Hospital Do Not Resuscitate Declaration and Order guidance. If your nursing facility's Social Service department is needing assistance with compliance regarding code status, Advance Directives, or end-of-life documentation, contact Simmons Healthcare Consulting, LLC at julie@simmonshc.com. 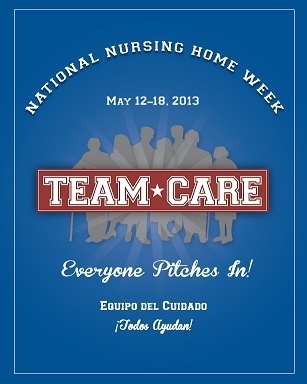 As we begin the biggest week of the year in long-term care, take a minute to consider the 2013 National Nursing Home Week slogan - Team*Care: Everyone Pitches In! I would suggest that in our industry, more than most, the only way to be truly successful is to work as a team. When one department struggles, it has an affect on every department. Begin today to demonstrate respect of your coworkers and initiate a culture of teamwork. Whether you are an Administrator, department head, or direct care staff, you have the ability to make a difference. Assist residents to group activities. Help family members search for missing items. Share successful behavior interventions with another staff member. Be punctual for Care Conferences. Come prepared to Quality Assurance / Performance Improvement meetings. Complete your designated MDS sections in a timely manner. Remind and assist family members with adding new belongings to the inventory list. Be kind to new employees. How are you demonstrating that you are a team-player at your nursing facility? Share your suggestions! Sending joyous wishes for a happy National Nursing Home Week 2013 to the absolutely amazing folks that I've had the privilege to work with over the past 19 years. Is your facility needing compliance assistance or interim staffing in the areas of Social Service, Activities, or QMRP services? Contact Julie at Simmons Healthcare Consulting, LLC. Celebrate National LTC Administrator's Week! Celebrate National Long-Term Care Administrator's Week March 10-16, 2013. For those of you dedicated to enriching the lives of residents daily at your nursing facility, we thank you. Balancing the overall operations at your home with customer needs, government regulations, and company policies requires great focus. Maintaining excellent care for the residents while achieving business objectives involves significant multi-tasking. Simmons Healthcare Consulting, LLC, commends those Administrators in nursing homes and assisted living centers who are committed to providing excellent quality of care and quality of life on a 24/7 basis. When is the Perfect Time to Recharge Your LTC Volunteer Program? When is the perfect time to recharge your nursing facility’s volunteer program? Right now! and, when implemented correctly, can supplement your marketing efforts to increase census by expanding the number of visitors in your building on a regular basis, observing the great care you’re providing. Start by establishing goals for each month this year and an overall goal to be achieved after twelve months. Make the goals simple, realistic, and achievable. Involve your entire team in the process, including any long-term volunteers that you currently have, and residents who have shown an interest. Your first goal should be to increase the number of volunteers or volunteer hours. Establish a ‘campaign’ to achieve record-setting numbers for your program each month. Ensure that your campaign is not just ‘dumped’ on the Activity Director. Encourage your team to spread the message to groups that they are members of outside of work. Community engagement is the key. Your marketing staff can assist with PR. In smaller communities, inform your local chamber of commerce of the program and offer to speak at the next meeting. Create a buzz in your community by contacting neighboring businesses, youth groups, schools, churches, and sororities. Use your volunteer campaign and goals to drive your social media presence. Outline the potential benefits that volunteering can bring to your residents and request an interview with the local newspaper. Contribute letters to the editor with the benefits of volunteering, updates to your goals, and calls to action for participation. Offer to submit a monthly “Ways to Volunteer” column. Most importantly when beginning a volunteer program have resources available for the volunteers. Utilize lists that can be reviewed with first-time volunteers to match their interests with your facility’s needs. Assign each volunteer to a specific task and follow-up to ensure that they feel comfortable with it. And always remember to follow your building’s policies and procedures regarding volunteers. What steps are you going to make this month to improve your volunteer program? Is your ultimate goal to have one volunteer for every resident? Have a great idea that has either worked for your facility or that you are planning to implement? Share it here! Need ideas to improve your volunteer program? Does your Social Service or Activities department need assistance with documentation? Is your Indiana nursing facility in compliance with QMRP regulations? Contact Julie at Simmons Healthcare Consulting, LLC (260-894-1417, julie@simmonshc.com) to start improving Quality of Life services for your residents. Have You Nominated Someone for an Age of Excellence Award? Nominations for the Age of Excellence awards are now open through REAL Services. As stated on their site - "Our purpose is to recognize those individuals who quietly support their loved ones and their communities through daily acts of kindness, compassion and selflessness. They remind us in the most fundamental way, what is most meaningful in life. They remind us that we are truly serving a higher purpose when we serve our fellow man." Deadline for nominations - April 11, 2013 at 4pm. The awards presentation will take place on May 16, 2013 in South Bend, Indiana. The keynote speaker is scheduled to be singer and songwriter, Amy Grant. Nominations can be made online here or by mail via this form (opens as a PDF). Business of the Year: A care giving agency or business that displays a commitment to the elderly. Caregiver of the Year for an Older Adult (60+): An individual who unselfishly provides unpaid care to someone who is 60 years of age or older. Caregiver of the Year for the Disabled (0-59): An individual who unselfishly provides unpaid care to someone who is less than 60 years of age. Education Award: A student, classroom (Kindergarten through College), teacher or school administrator that has displayed an understanding of the value of older adults. Hoosier Lifetime Award (over 60): An individual, 60 years of age or older, who has demonstrated a lifetime of service to his or her community (paid or unpaid). Kimble Volunteer of the Year: An individual, 60 years of age or older, who has displayed a commitment to volunteerism in service to the elderly. Volunteer of the Year (under 60): An individual, under 60 years of age, who has displayed a commitment to volunteerism in service to the elderly. Volunteer Group of the Year: A group of volunteers, who has displayed a commitment to volunteerism in service to the elderly. Contact information for REAL Services can be found at the above links if you have any questions. As always, contact Simmons Healthcare Consulting, LLC, with any questions, concerns, or needs related to your Quality of Life (Social Service, Activities, QMRP) departments. but a dynamic educational experience designed exclusively for strategic leaders in aging services." More information can be found at LeadingAge/Peak. Need assistance with your Social Service or Activities departments in 2013? Questioning whether your current consultant is providing cost-effective outcomes for your nursing facility? Wondering if your in compliance with QMRP requirements? Contact SHC today and we can discuss how to implement positive changes for your Quality of Life departments.